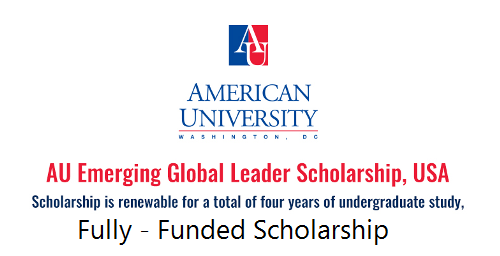 American University offers the AU Emerging Global Leader Scholarship (AU EGLS) annually to one exceptional International Undergraduate Student. About Scholarship: The AU EGL scholarship covers all billable AU expenses (full tuition, room and board) for one international student who will need a visa (preferably an F-1 or J-1 student visa) to study in the United States. The scholarship does not cover non-billable expenses such as mandatory health insurance, books, airline tickets and miscellaneous expenses (approximately U.S.$4,000 per year). Excellent oral and written communication skills in English, with a minimum 90 TOEFL iBT (with no subscore lower than 20) or 7.0 IELTS or 600 paper-based TOEFL (or above). Duration: It is renewable for a total of four years of undergraduate study, based on continued satisfactory academic performance. How to Apply: Only one AU Emerging Global Leader Scholarship is available for Fall August 2018. If you are not selected as the 2017 AU EGL recipient and wish to continue the application process, you may be eligible for partial merit scholarships. Students must apply Regular Decision only and must submit the AU EGLS application, the Common Application and AU Supplement, and all supporting documents by December 15, 2017. To apply to the AU Emerging Global Leader Scholarship, simply complete the online application from the link below. Important Notes: Preference will be given to international students who have overcome various obstacles and challenges as well as those from diverse and under-represented global and socioeconomic backgrounds. Now that all the information about American University (AU) Emerging Global Leader Scholarship (AU EGLS) for International Students has been delivered nicely; talented students who are eager to pursue their Free Tuition/Scholarships/Study in USA can apply now.